Nothing says summer like chocolate chip cookies! Add some vanilla ice cream, make a sandwich and I don’t know that it could get much better than that. This is my secret to chewy cookies (even after they cool). Originally posted October 2013. Enjoy! I’m not a fan of the crispy chocolate chip cookie. I like em chewy, just the way they come out of the oven. I am a big fan of the classic Nestle Toll House recipe but for one thing – they get crispy when they cool. I would still eat them of course. But I always wished they would stay chewy. Until one day, something magical happened. As I went to make cookies a few months ago I realized we only had bread flour . Because I was already into the process of mixing, I decided to throw caution to the wind and use it instead of the all-purpose flour the recipe called for. My result? 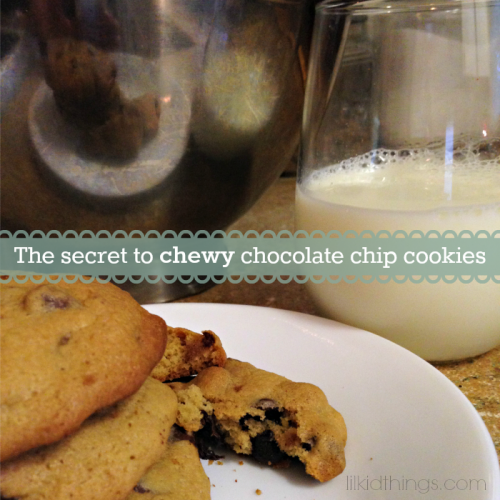 Perfectly chewy cookies that STAY CHEWY even after they cool! I love them. My husband loves them and I am so happy with the results I just had to share! That is the only change I made to the recipe on the back of the chocolate chips bag, but I typed up the recipe here in case you want to try it for yourself. I’d love to hear how you like them! 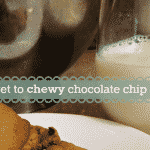 Delicious chewy chocolate chip cookies that stay chewy! Spoon onto ungreased cookie sheet and bake for 10-14 minutes on 375. I cannot wait to try this! Thank you! The crunchy cookies are not my favorite. Yay! I can’t wait to hear what you think. I love happy accidents! Love this! I’m a fan of crispy, but my kids definitely prefer chewy cookies. Totally going to try this next time we bake!